Opera	legend	Maria	Callas	gives	a	magnificent performance in this mythical tale of love, betrayal and revenge written and directed by Italy's most controversial director. Previously unavailable in the UK on DVD or Blu- ray, Medea is released by the BFI in a Dual Format Edition (containing both DVD & Blu-ray discs). A fascinating collision of Freudian and Marxist themes, Medea is adapted from the drama written by Euripides. Pier Paolo Pasolini's disturbing vision of personal and national conflict saw Maria Callas in her only dramatic film role, giving an extraordinary performance as the high priestess whose love is threatened by corrupt political ambition. This stunning restoration by the Société Nouvelle de Cinématographie features Pasolini's preferred soundtrack with the voice of Maria Callas. Amongst the special features are two alternative audio options: the original Italian and English- language soundtracks. 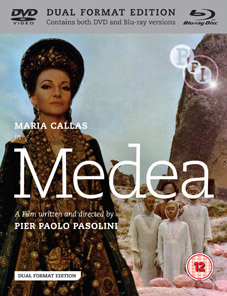 Bold and uncompromising, Pasolini's Medea is a complex blend of classical mythology and contemporary social criticism. Madea will be released on UK dual format (DVD and Blu-ray) by the BFI on 5th December 2011 at the RRP of £19.99. Illustrated booklet featuring essays, reviews and biography.